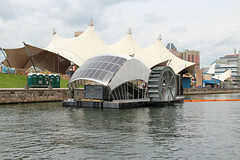 This water wheel, located in Inner Harbor, uses a combination of water and solar energy to dispose of trash originating from the Jones Falls Watershed. The water wheel filters out trash and debris from the flowing water, and dumps them into a large trash can located on the backside of the structure. Once the dumpster barge if full, it is towed away and replaced. The wheel is capable of filtering out trash as small as cigarette butts and stray leaves. 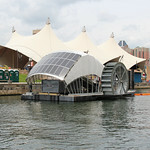 The Inner Harbor Water Wheel is invented and constructed by Clearwater Mills, and owned and maintained by Waterfront Partnership of Baltimore. Spalatorie si Curatatorie Chimica Ecologica "COOP. Igiena"